There are many wonderful relationships that develop at SFV. Many find their best friend on skates and decide to become “derby wives.” Derby wives give that extra support to one another on and off the track. Here is what makes Killo, Legacy, Lux, Sassy, Vendetta, and Jams and Bratty’s wifedoms so unique! 1) What made you decide to become derby wives? I also wanted Lux to be a part of it since she's the reason why I’m here in derby. She introduced me to Vendetta before I started playing. We all clicked with each other within the first 5 minutes. We’re constantly laughing with or at each other and I love that about us. Killo: We just clicked and it felt right. We have the same work ethic when it comes to practicing. Always up first and ready to roll. Jams: I'm pretty sure that Bratty was peer-pressured into a very public proposal at Skating Plus after I came off the track in a bout against the West Coast Derby Knockouts…but we had already secretly decided that we were each other's "person" long before that. 2) How long have you been derby wives? Bratty: We have been derby wives since May 10th, 2014. 3) What is your favorite memory of your derby wife (or wives) so far? Lux: Well I can't narrow it down to just one memory. Vendetta is the classy one who gets all the free drinks. Sassy is the tough girl, but true softie at heart, and I'm the anarchist problem child. lol. So anytime we are together, it's a recipe for a good time. Killo: My favorite is when we went to mess with an opposing team, the Varisty Brawlers, and Danny (Razor's husband) chased us with a bat and we had egg rolls tossed at us. All caught on video in nighttime mode. It was awesome. 4) How do you support each other? Vendetta: This is definitely a strong area for us. Like every skater, we have our ups and downs, good days and bad days. We all have vented to each other about how we feel about our own skating and boast a little about ourselves on good days. We are constantly giving each other constructive criticism and encouragement to continue trying. All 3 of us have all been on the injured list and 2 of us had serious injuries that kept us off the track for months. Having people encouraging you to keep your chin up and stay focused on the goal of returning to the track is imperative to feeling like you’re still part of the family, even when you are away. For me, personally, when I was out and feeling down, both my wives would still text me and call me and give me a recap on practices and going-ons. There is no better feeling in the world than knowing people care about you when you are away. Killo: We support each other by just being there...She is my rock and I am hers. We vent to each other on everything and we know that we can rely on each other. Period. No matter what. Jams: Even though Bratty now lives in another state (and is on a team called the Wreckers! ), we still talk all the time about our derby experiences and are each other's sounding boards. This past year, we've both gone through our own challenges with Bratty starting fresh at a new league and my getting injured, so we look to each other to gain perspective and offer encouragement. 5) Is your relationship different now than when you first "married?" Legs: Our bond has grown closer through the years. We have gone through all kinds of life experiences together. We are lucky to have each other! Bratty: I know that we are forever linked through derby and our “marriage.” She is coming to Portland for Rose City Rollers’ "Derby Daze" bootcamp. I can't wait to see her!!! Banked-Track Babes: The Same But Sideways? 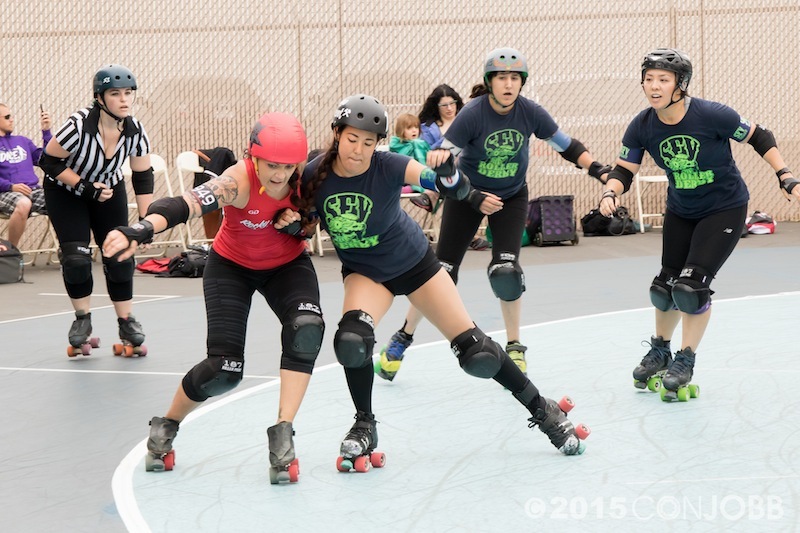 A few weeks ago, five brave souls from the SFVRD Wipe Outs volunteered to fill-in for some missing players in a banked-track bout in San Diego. We would be playing with the North County Derby Alliance (NCDA) against the Sparks, part of the San Diego Derby Dolls. Just a reminder, both SFVRD and NCDA are flat-track based leagues. Most of the ladies of SFV—Stockholm Syndi, Derp, Agony Christie, Pink A Sassin, and myself (Beat-her Pan) —had never even set foot on a banked-track, let alone skated in a scrimmage or a bout (except Pink A Sassin, who had first trained with LA Derby Dolls before entering SFVRD). We figured, “It will be just like flat-track except…kind of sideways….right?” But we soon discovered the challenges ahead of us. 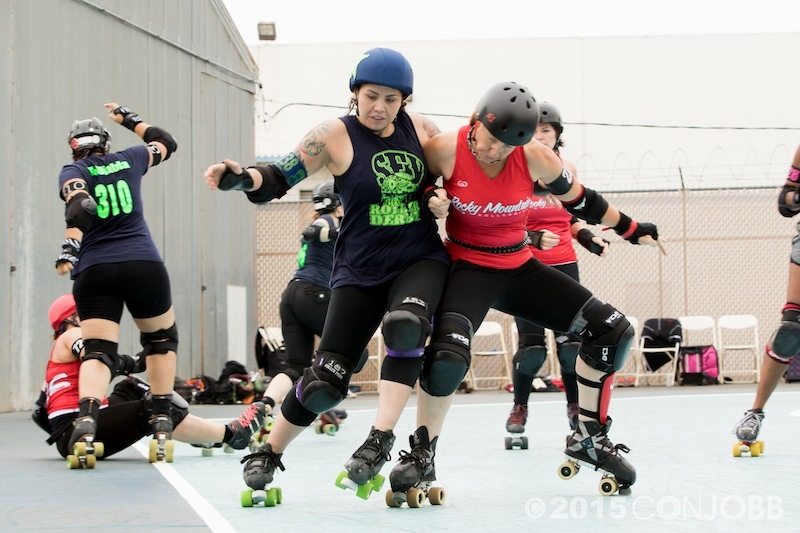 The LA Derby Dolls were kind enough to let us practice at Derby Por Vida, a beginner level practice. First challenge: how do we get on the track? After finally scrambling our way up, we started getting used to the curves and slopes of the track. After a myriad of falls and “bug-like” slides down to the middle of the track, it was time to face a whole other beast: stopping. But after a few more falls and some death defying plow stops from the top to the bottom of the track, we felt more comfortable. 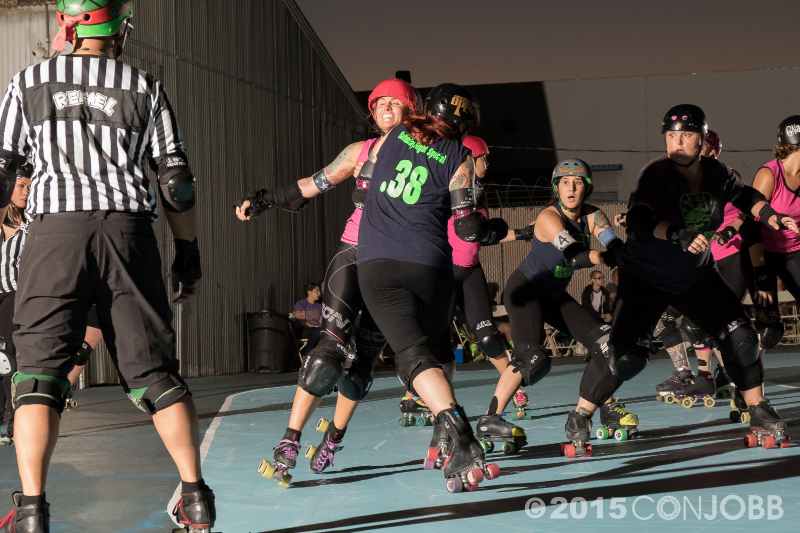 And after a short brief of the rules from Stefcon of the LA Derby Dolls, it was time for our bout! Saturday came and it was our turn to get on the track. Stockholm was awesome enough to make us shirts with our name and numbers with "and Friends" printed on the front (since our team for the day was NCDA and friends). We reminded ourselves of the biggest difference in rules for banked-track—don’t stop moving forward or you get a penalty, don’t go clockwise around the track or you get a penalty, penalties are served during the next jam, jams are only one minute, the lead jammer can switch in the jam, and pivots line up in a separate lane in front of the rest of the pack—and then the bout began! Everyone needs a little help from their friends sometimes, so when the North County Derby Alliance called, The SFV Wipe Outs answered and sent five of their fiercest ladies down south to join NCDA against the San Diego Derby Dolls' Sparks. For most of the Wipe Outs, this was their first time playing on a banked track, let alone taking on a team from one of top ranked banked track leagues in the country. They jammed, they blocked, they gave it their all, and they helped NCDA put up 73 to 238. The first few jams for each of us were a bit…chaotic…but after awhile, we kind of got the hang of it. Constantly moving forward and not skating clockwise on the track was one of the tougher challenges for us (besides staying on our feet), but we all felt improved in these areas by the end of the bout. Yes, the other team beat us—by a lot—but we felt we had skated our best and accomplished a lot by simply setting foot on the banked-track and improving throughout the practices and the game. Though we were all TERRIFIED about the craziness that we had gotten ourselves into, I don’t think any of us regret our decision to give it a try and the experiences and FUN we had on the banked-track.